Lompoc is having a party at the Sidebar on North Williams today (November 29, 2011) at 4 PM to show off 9 of the 10 holiday beers they've brewed this year. There has been plenty of bloggage about the beers -- I'll provide links to everything I know about below -- so I'm going to talk mostly about three Don Younger-inspired beers: two variants of Old Tavern Rat that Lompoc is releasing, and Russian River's cleverly named Don the Younger, on tap right now at the Horse Brass. 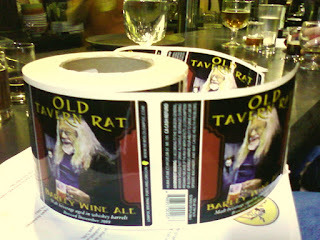 Lompoc has been brewing a barleywine called Old Tavern Rat for well over ten years -- at the 2008 Lucky Lab Barleywine Festival they rolled out a keg of it from 1998 -- and in my experience it has its ups and downs. This year's batch is fantastic: a very classic West Coast take on the style, bitter and boozy yet balanced, with notes of maple, orange, and brown sugar. It was news to me that Old Tavern Rat was named after the late, lamented Horse Brass owner Don Younger, who according to Lompoc owner Jerry Fechter used that nickname as his email address. But in talking about the bourbon barrel aged version of Tavern Rat, Jerry said Don "would f***in' hate this beer". Aged for 10 months in Heaven Hill barrels and cellared for a year after that, it definitely is not as balanced and approachable as the "normal" Tavern Rat (which is itself aged for nearly a year, just not in wooden barrels). If you like lots of bourbon, vanilla, and oak in your barleywine, give it a whirl. It's better as it warms towards room temperature, but given the choice I would still take the un-barreled version. The bourbon-aged Old Tavern Rat is available in 22-ounce bottles this year, with John Foyston's oil painting of Don as the label art. A far different tribute to Don is Russian River's Don the Younger, which is described as a hoppy session ale. At 5.5%, I think it's a little out of the session range, but it is a lovely beer. Lots of hop bitterness, on top of a bready malt base, it's both satisfying and drinkable. Reviews on Beer Advocate tend to call out the floral hops, but I didn't find it to be especially floral. Despite the name, it's certainly not in the same floral-hop category as Pliny the Younger, or even Pliny the Elder, and that's just fine. The Horse Brass laid in 24 kegs of it last month on the occasion of the bar's 35th anniversary -- in fact the beer was commissioned by Don before his untimely death last year -- and as far as I know it is only available there and at Russian River's Santa Rosa pub. If you haven't tried it yet, make a pilgrimage to the Brass and enjoy a pint or two. Back to the Lompoc holiday beers. Certainly the Tavern Rats are my favorites of the Lompoc holiday brews, but many of the others are also worthy. The only two that I would avoid are the Brewdolph -- the yeast gave it overpowering clove and camphor notes that I don't care for at all -- and the Jolly Bock which tastes to me like it was not lagered long enough (it's a little gamey). It's a shame about the Brewdolph -- the version last year that was partially aged in Cabernet Franc barrels was very charming. I'd give Old Tavern Rat more props than that. In the past few years, it's been one of the most reliable winter ales. It's always near the top of my must-try list. More props than saying "it's fantastic"? Sorry, I should have been more clear. I was referring to the "and in my experience it has its ups and downs" part." There may have been some downs several years ago, but the last--what, five?--have been totally reliable. If I can't nitpick in comments, where can I?